Fall is now in full swing but that doesn't mean you have to put all your summer dresses away. There are so many ways to transition your favorite summer pieces to Fall-appropriate outfits. I picked up this white eyelet dress a few months ago and had been wearing it a ton during summer months. However, I am not ready to put it away yet. To extend the lifespan of my summer dress, I paired it with my beloved denim jacket and a scarf then I finished off the look with my new OTK boots. Totally in love with this....I totally want to try this now! Those boots are great! I love how you made this dress transition to fall! It looks great with the grey/taupe accessories! 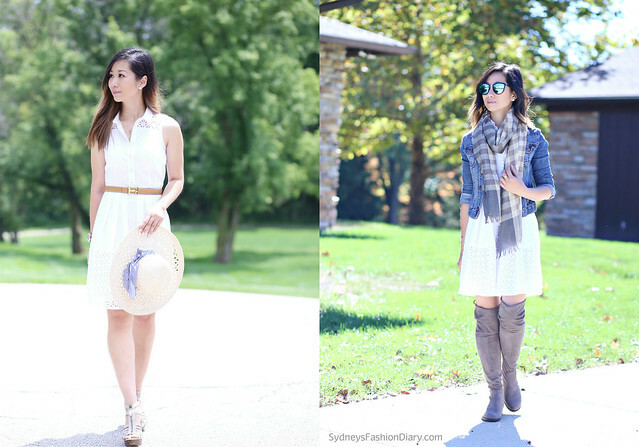 Sydney, you did a great job transitiong the LWD. A couple of Winter ago I wore a similar outfit with my Lace White Dress, Taupe OTK Boots and a Houndstooth Blazer on top. I must try it now with a pretty scarf and a denim jacket. You look lovely and those are some great boots. Hi Dear.You look gorgenous! I really like your style! Perfect transition outfit! May have to try it wiht my closet! It looks great with the grey/taupe accessories! Love.